Jumbolair Aviation Estates is an exclusive fly in community located just north of Ocala. The private community offers estate homes with the convenience of having your own private hanger and runway only for Jumbolair residents. The beauty that surrounds this location is world class with stunning rolling hills and horses grazing in the green pastures. A dream come true for any aviation enthusiast. Want to sell a home here: Please click here for a free market analysis of your home then we can discuss the best marketing plan for your home! Want to look at homes here: Below is a list of homes currently available. If you would like a private tour of any of the exclusive homes for sale, please contact me. I look forward to showing you all the amazement of Jumbolair. Jumbolair is very unique. However if you are looking for private estate homes, consider Golden Ocala or one of Ocala’s beautiful farms. Aviators! 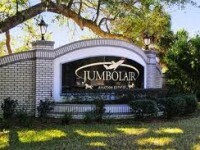 Welcome to your dream home located in the most upscale Fly-In community, Jumbolair! This spectacular home and it's matching hangar will not disappoint. It's loaded with every possible amenity and finished with the utmost style. Newly remodeled, this home features a wine cellar, His & Hers Master Bathrooms and closets, travertine flooring, multiple wet bars in entertaining spaces, gas fireplace, coffered ceilings, and much, much more! Private climate-controlled hangar is immaculately outfitted with full kitchen, additional wine cellar, & basketball court. Solar heated, zero entry salt pool & spa beckon from the screened lanai complete with spacious cabana. This home truly leaves nothing to be desired!